Get ready to limp out of bed tomorrow. It's time to feed the calves. With a steady diet of raises, raises, and more raises, they'll grow in no time. Although Entourage fans love listening to Johnny complain about his small calves, blaming genetics and contemplating calf implants, the truth is he's not alone. Calves are notoriously tough for anyone to really sculpt and develop. They're stubborn, and that's why they've become one of my favorites. If your calf workout consists of a couple of rushed sets of 10 reps on the way to the locker room, listen up. A more strategic approach will have you hating life and staggering to work—in a good way. Unlike some guys, I don't get hung up on hitting the gastrocs and soleus muscles of my calves with equal volume and force—although I don't avoid it, either. For me, it's most important to really stretch the calf muscle on the negative, and really squeeze the top of the movement. By controlling that motion all the way through, I've seen great results in myself and others. Use a full range of motion for each rep, and make the reps slow and controlled. Don't bounce on, say, the calf raise machine. You know who you are! Go as heavy as possible, while observing Rule No. 1. Fail on every set when working stubborn muscles groups. Alternate the below workouts for the next four weeks or so, doing each once a week, so you're training calves twice a week total. I usually try to train calves on a randomly chosen day as long as it's not my main leg day, and as long as the day I choose doesn't jeopardize that leg day with calf soreness. Whatever the day, I usually train calves after cardio or abs. Select a weight where you fail near the top end of the prescribed rep range. If you can crank 20 reps on these moves, for example, you went too light. 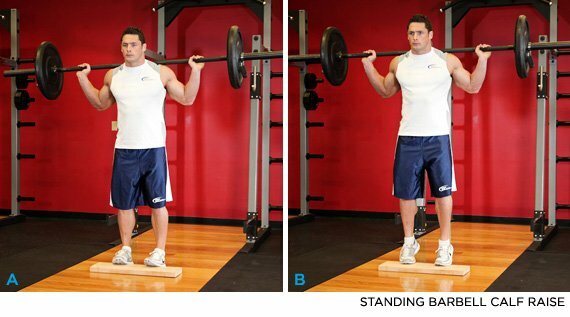 By the way, these single-leg leg-press calf raises, which became drop sets to burnout using legs? Those should make it hard to walk. You're welcome. * Do 8-10 reps per leg through a full range of motion. Then put both feet on the machine and crank out reps until the burn is too intense to continue. There's no need to alter the weight before putting both feet on the platform. Because you're adding your other leg, the load is considerably lighter.